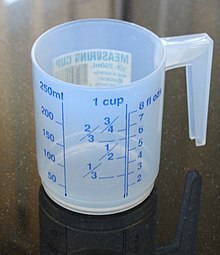 A cup is a unit of volume measurement of volume equal to 16 tablespoons, ½ pint, ¼ quart, or 8 fluid ounces. A US cup is about 237 mL. Rougher equivalents are 240 mL and 250 mL, where the latter fits nicely with a US pint of 500 mL and a pound of 500 g.
A metric cup is 250 mL in Australia, Canada, New Zealand and the UK. These countries previously used the imperial system, in which a cup would be 284 mL or 6/5 US cups. A Japanese rice cup is 180 ml. A measuring cup of this size is sometimes included with rice cookers. A teacup, often seen as a unit of measurement in Indian recipes, is about 190 mL, or ⅔ of an imperial (UK) cup.